What’s that weird looking contraption on the Promenade? 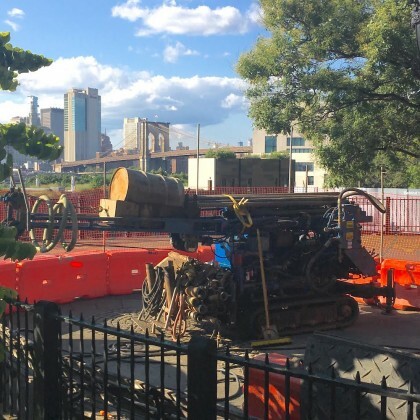 As reported by Mary Frost, the DOT is conducting environmental testing in thirty locations between Atlantic Avenue and Sands street in preparation for the $1.9 billion dollar rehabilitation of the BQE. Opened in 1951, The Promenade comprises the top level of the roadway’s 70 year old triple cantilever. During this phase of the project, “a boring machine digs out a cylindrical bore of material below the surface. Various tests are conducted on the bore, such as a strength test, an exam for chloride from roadway deicing salts, measurement of volume of permeable voids and more.” Testing is expected to conclude at the end of August and will not damage the Promenade or its gardens. For project schedules, timelines, history and more information, visit the DOT project website. On first glance I read “BBQ” instead of BQE, and thought the oil barrel was a smoker. Sigh. Only slightly more expensive than Hill Country was.